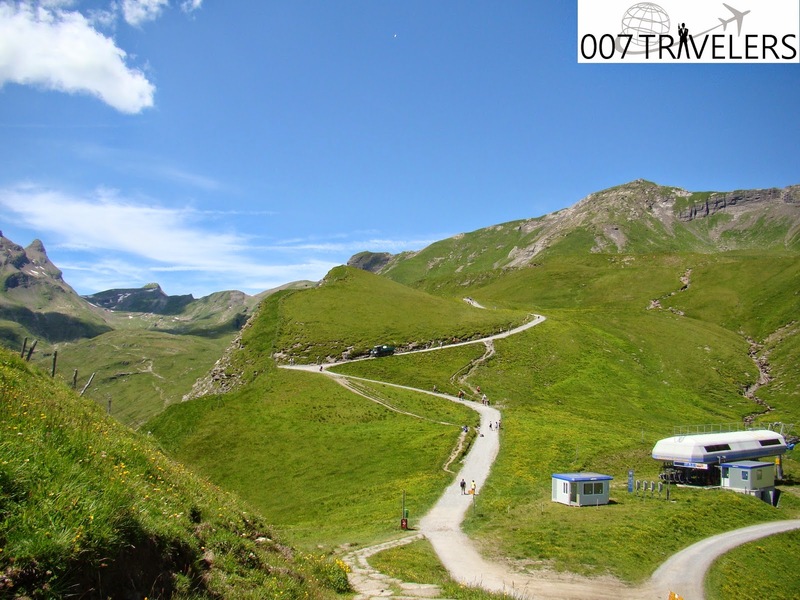 In order to read our 007 Travel story of Switzerland from the day one, click here. You can follow there day by day our traveling. 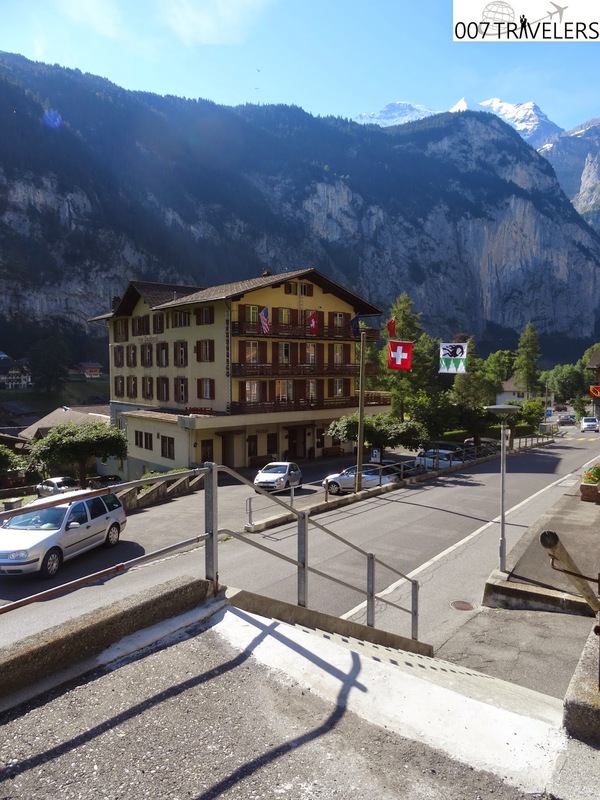 We left Hotel Eiger behind and headed to the mountain train from Mürren BLM to Lauterbrunnen BLM, duration 21 minutes (later part of the journey was made again using a cable car). 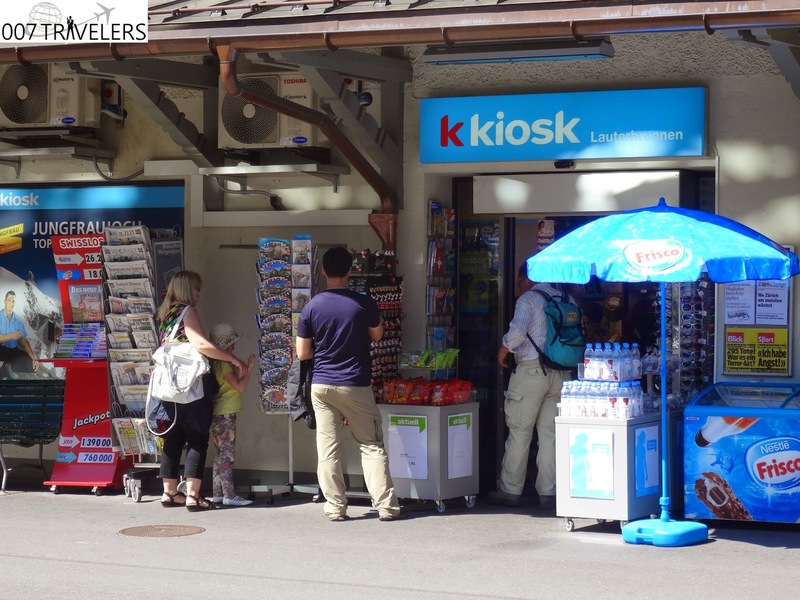 Without the Swiss Pass the costs would have been 8,85 EUR / adult, 4,42 EUR / child. The Lauterbrunnen–Mürren mountain railway (German: Bergbahn Lauterbrunnen–Mürren, BLM) is a hybrid transport system in the Bernese Oberland area of Switzerland, which connects the villages of Lauterbrunnen and Mürren. 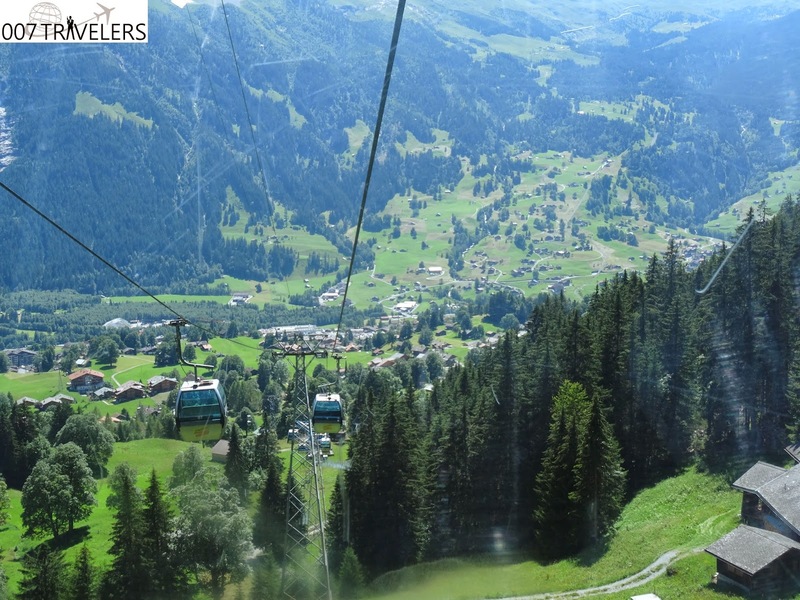 The system consists of a connected aerial cableway, also known as the Grütschalpbahn, and an adhesion worked mountain railway. 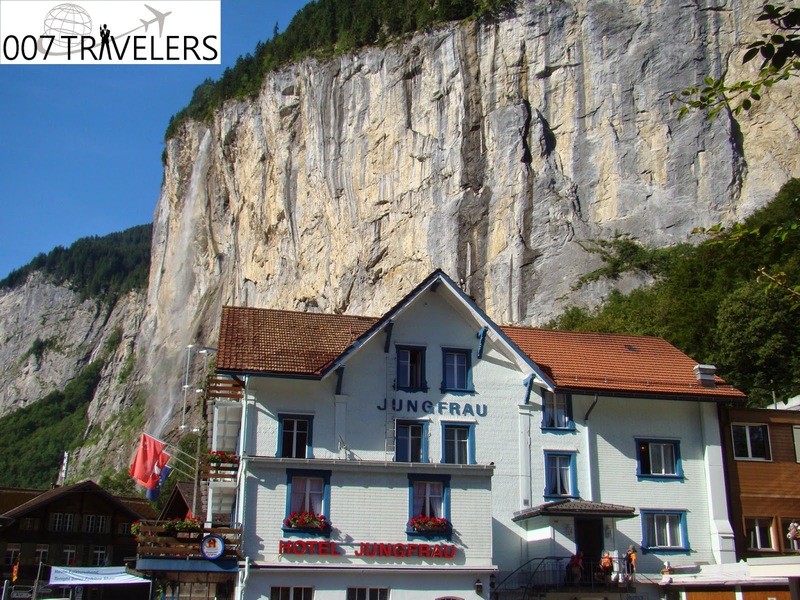 One of the most famous tourist attractions of Lauterbrunnen is The Staubbach Falls. The Staubbach Falls (German: Staubbachfall) is a waterfall in Switzerland, located just above Lauterbrunnen in the Bernese Oberland. 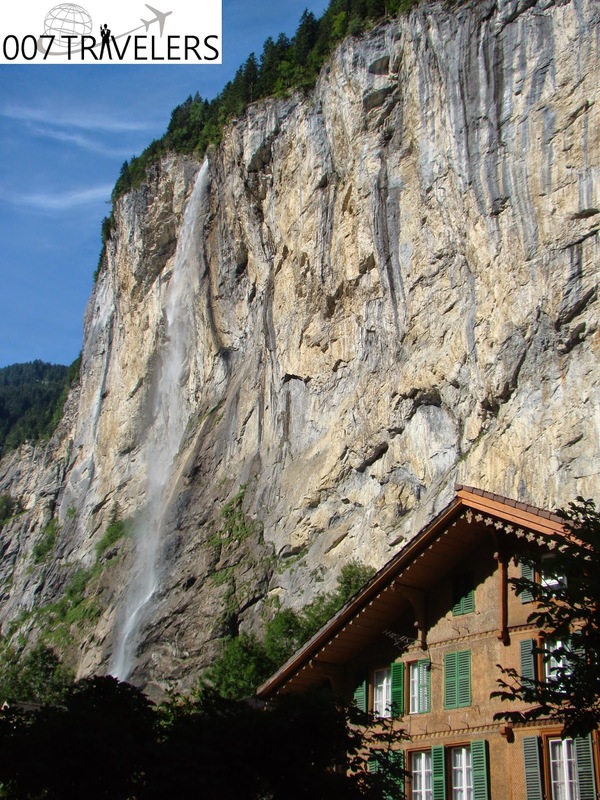 The waterfall drops about 300 metres (1000 ft) from a hanging valley that ends in overhanging cliffs above the Lütschine River. 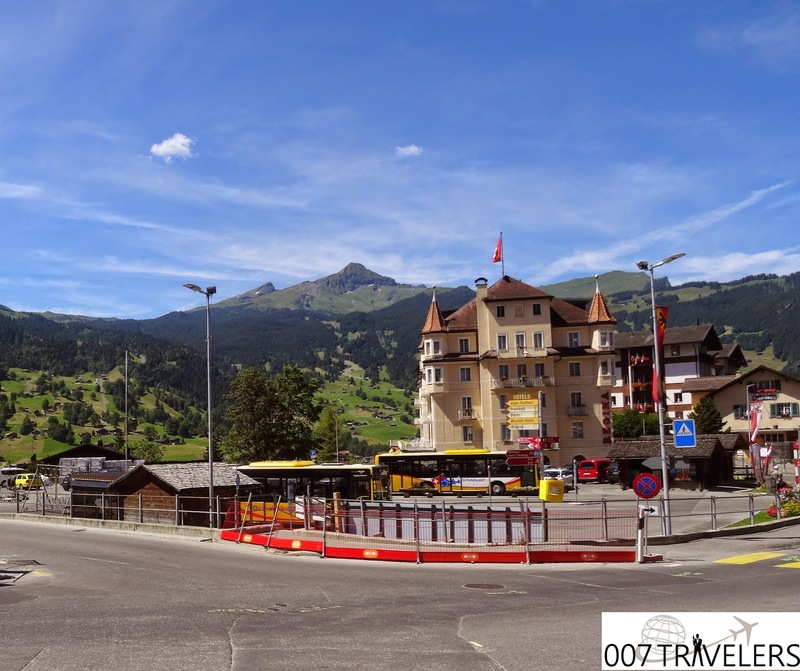 We reached our hotel which can shortly be seen in "On Her Majesty's Secret Service" (1969) (later "OHMSS"), when Bond girl Teresa "Tracy" di Vicenzo (Diana Rigg) picks up Bond to her car, after Ernst Stavro Blofeld's (Telly Savalas) henchwoman Irma Bunt (Ilse Steppat) and her men try to kill Bond, when he's making a phone call in a phone booth. 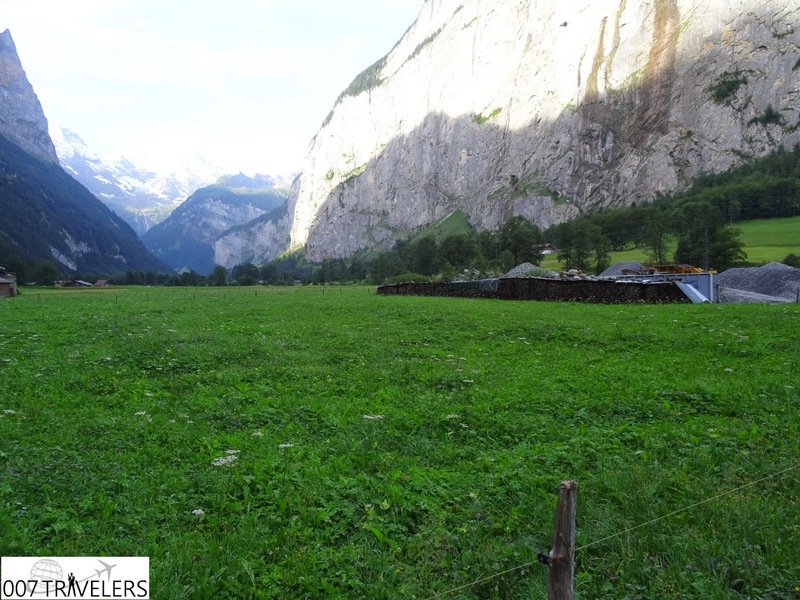 Lauterbrunnen doubles for an Austrian city Feldkirch in the film. 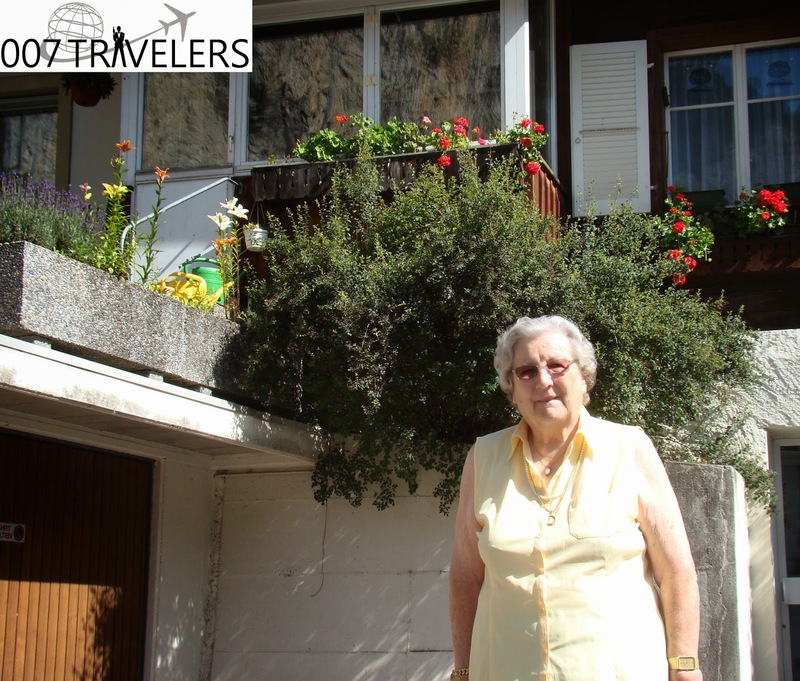 We met Mrs. Myrtha Zwahlen, who is former owner of Hotel Jungfrau and we interviewed her about 007 movie "OHMSS" (1969) and about George Lazenby and other filming crew. See the interview here. 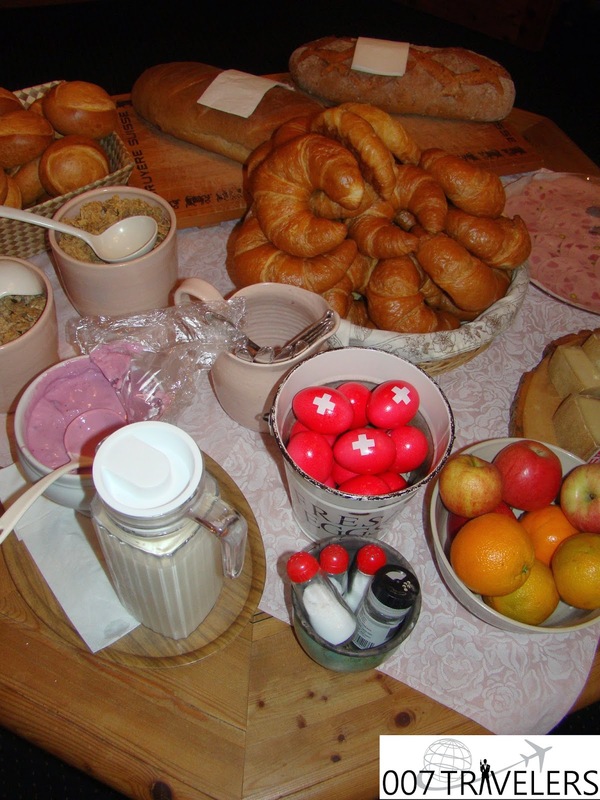 Later we visited Mrs. Zwahlen´s home, she showed us her hand-made deckelis, which are really great! Hotel's parking lot was the place where the phone booth scene of "OHMSS" (1969) was filmed. 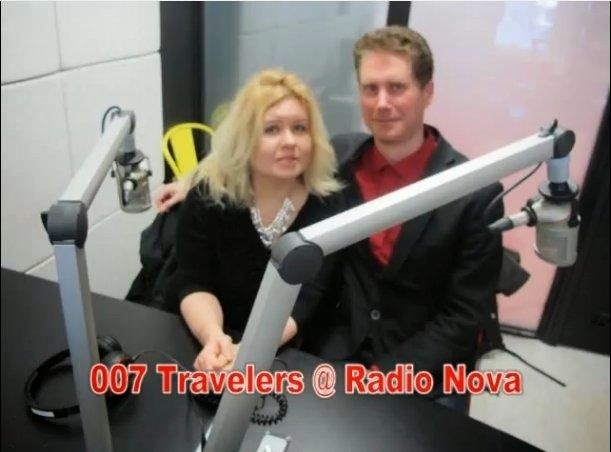 and they can be seen in "OHMSS"
Near the hotel are some other "OHMSS" filming locations, such as places where Bond and Tracy escape with her Mercury Cougar. 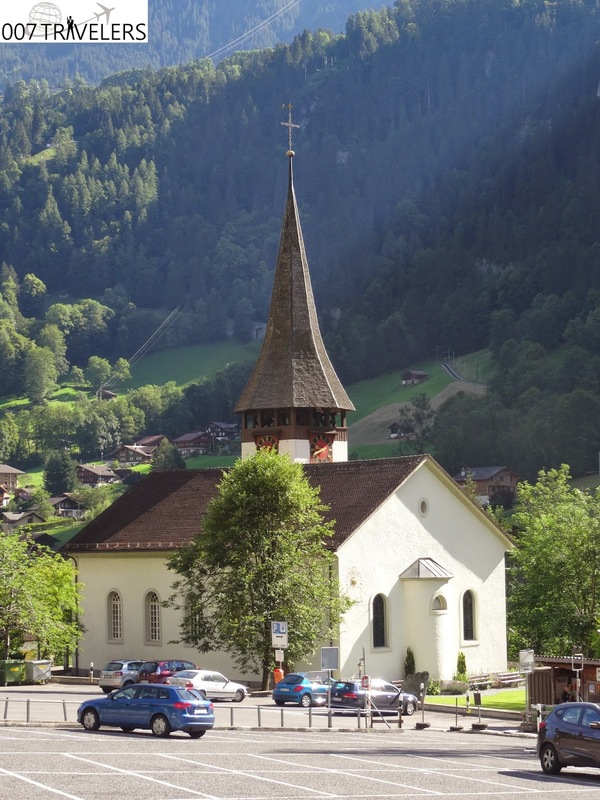 This Lauterbrunnen village church is quite close to Hotel Jungfrau and it is also visible in the film. 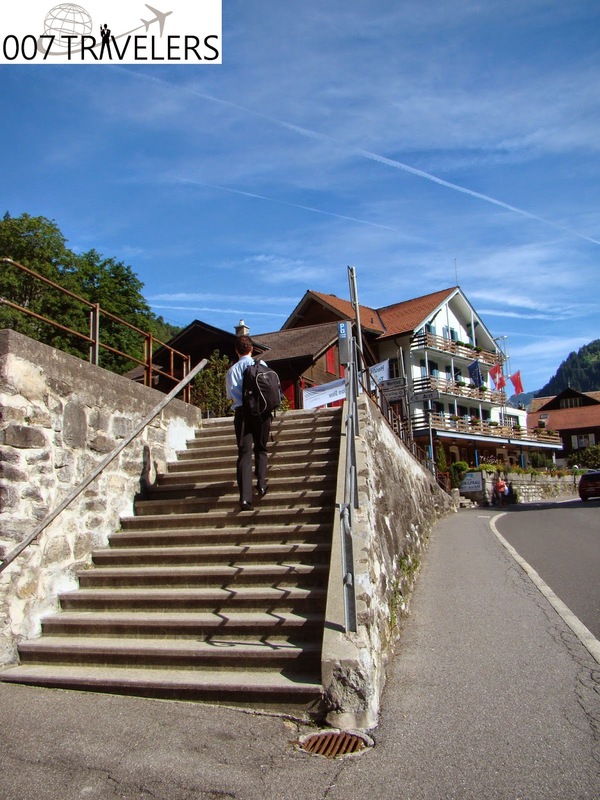 Also the place where Stock car racing happened, was just outside of Lauterbrunnen village. Mika ran a couple of kilometers to the place. 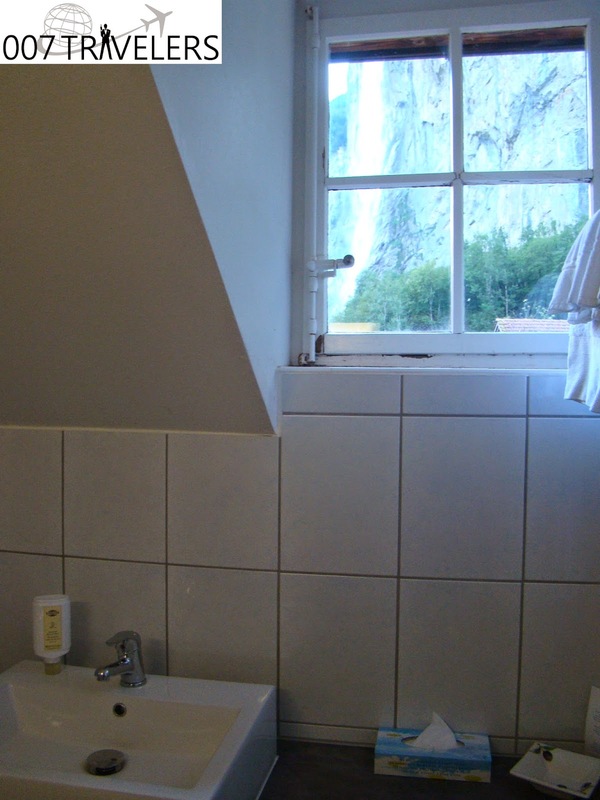 Then we traveled from Lauterbrunnen to Grindelwald by train. Grindelwald is a village and municipality in the Interlaken-Oberhasli administrative district in the canton of Bern in Switzerland. 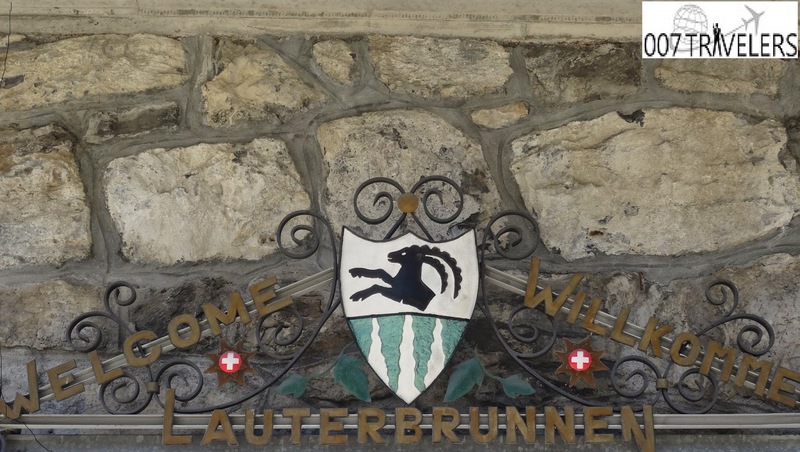 Besides the village of Grindelwald, the municipality also includes the settlements of Alpiglen, Burglauenen, Grund, Itramen, Mühlebach, Schwendi, Tschingelberg and Wargistal. 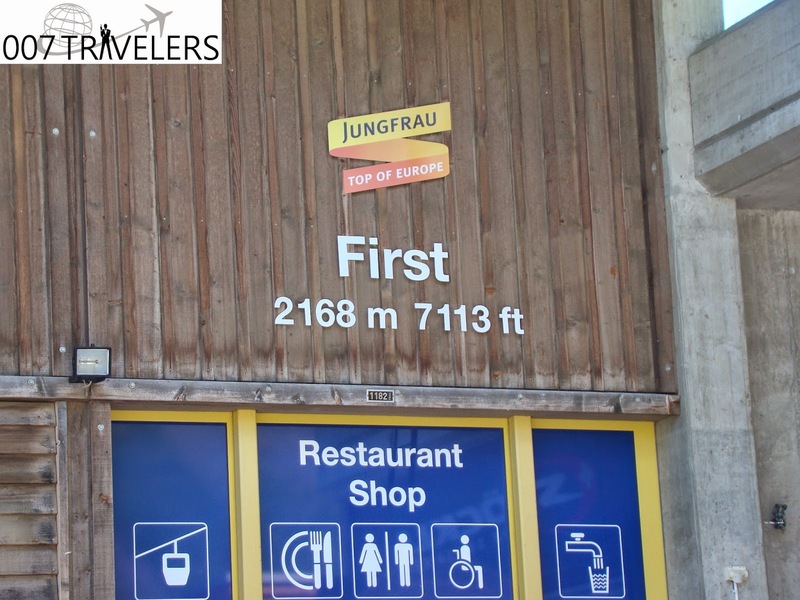 Grindelwald village is located at 1,034 m (3,392 ft) above sea level in the Bernese Alps. At 11.33 by Regio 142 train, direction Interlaken Ost, one change in Zweilütschinen at 11.42, and we moved on towards Grindelwald, where we were at 12.09. 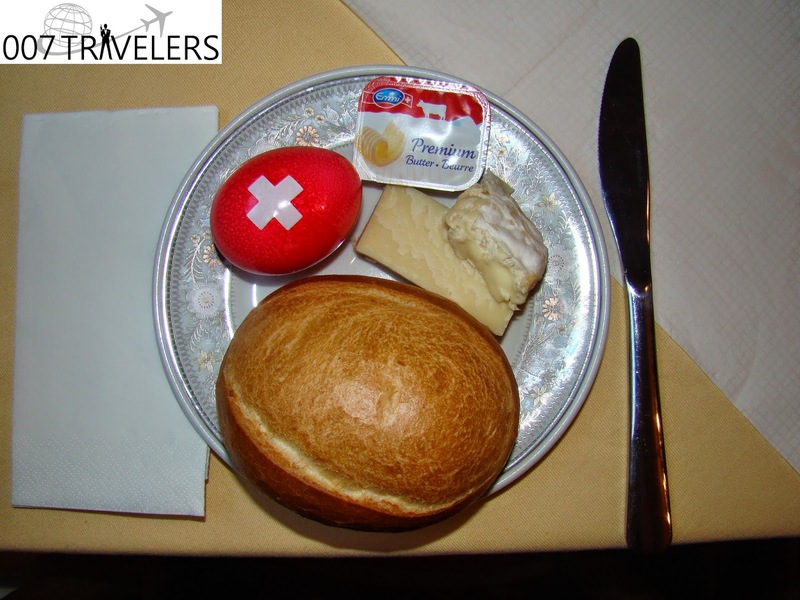 Without Swiss Pass this would have cost 7,19 EUR / adult, and 3,60 EUR / child. 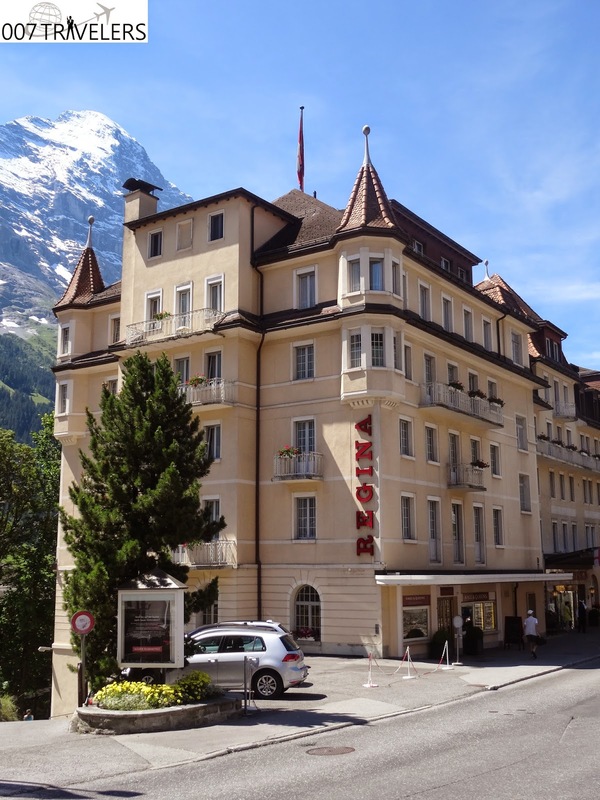 We found Grand Hotel Regina, at Dorfstrasse 80, only 2 minutes away from Grindelwald railway station. There is nowadays a bus station in front of Grand Hotel Regina. 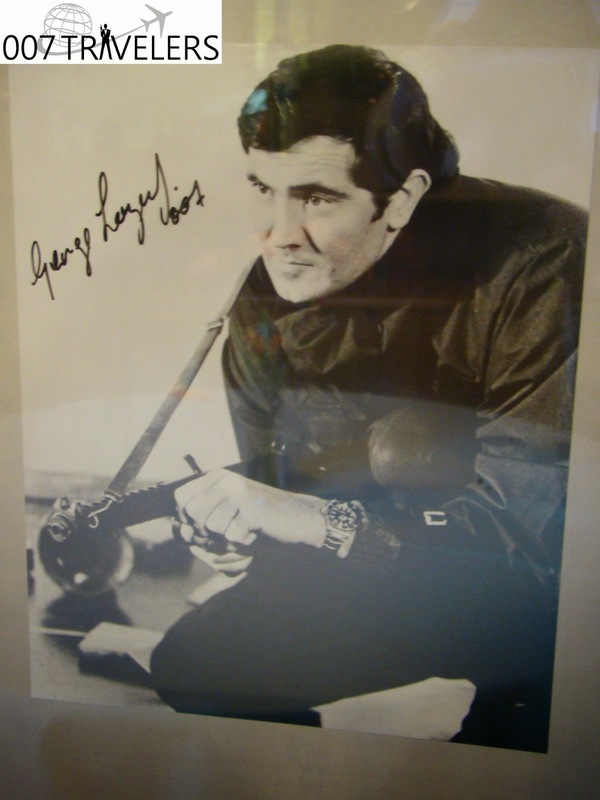 In the movie there was an ice-skating rink, where Bond meets Tracy. 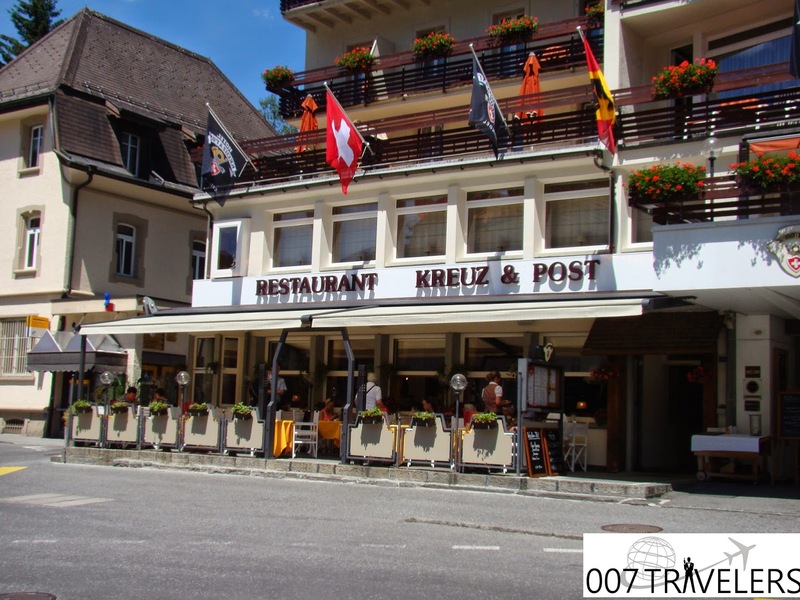 We had a lunch just opposite Grand Hotel Regina, on the terrace of Restaurant Kreuz & Post. 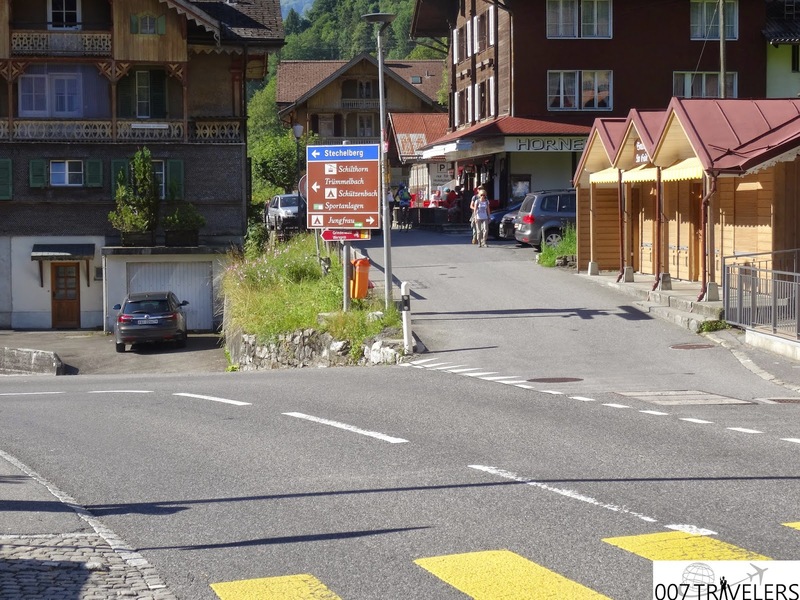 After the lunch, day was beginning to be really hot, when we walked 20 minutes towards Grindelwald cable car station, where kind of small cable cars go up 30 minutes to First, which is a Bond location from a Bond book "Never Send Flowers" (1993), by John Gardner. First is a minor summit on the slopes of the Schwarzhorn in the Bernese Oberland. 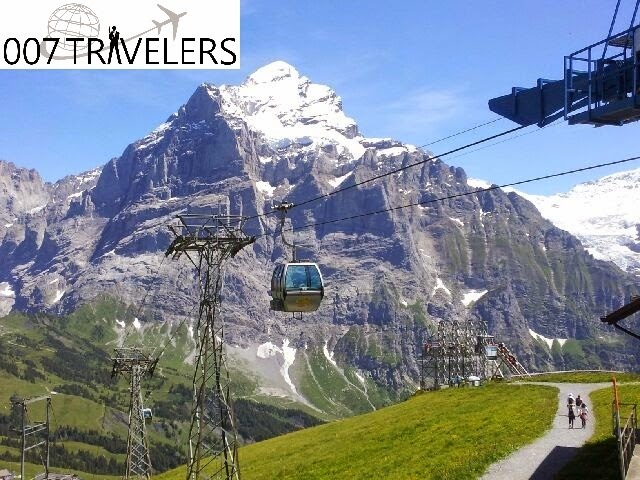 It is mostly known as a cable car station above Grindelwald and as a popular hiking area with the Bachalpsee in proximity. It is also the destination of the classic hike: Schynige Platte-Faulhorn-First. The view from First down to the valley was really fantastic! After buying some souvenirs, we came back down using the same route and on the way we were able to see the "First level", where we could see nicely down to Grindelwald valley. "The police presence was obvious. Two cars and a police van blocked the little road to the chair lift, and a large sign, in three languages-German, French and English-proclaimed that the chair lift up the mountain, to the First area with its great view of the Grindelwald Basin, was closed until further notice. The entrance was also blocked off with yellow crime scene tape." 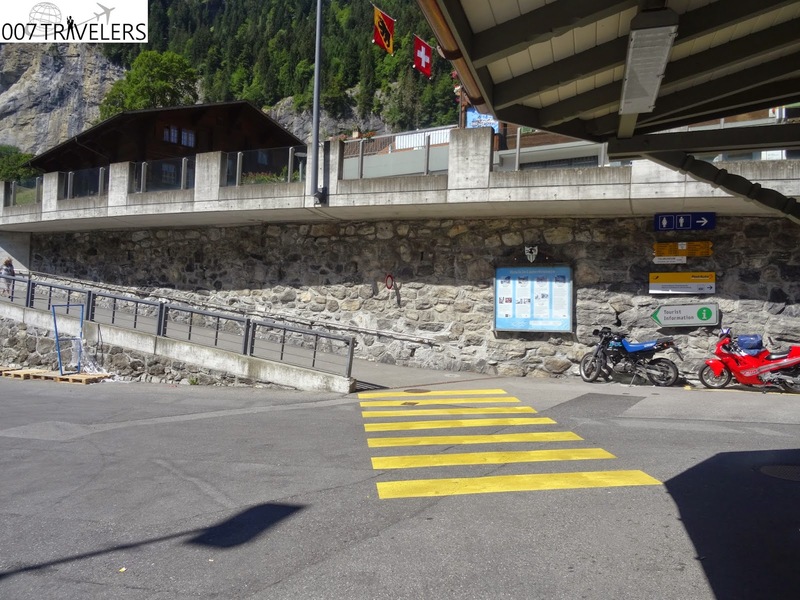 John Gardner: "Never Send Flowers"
Then back to the train station and direction was Interlaken. 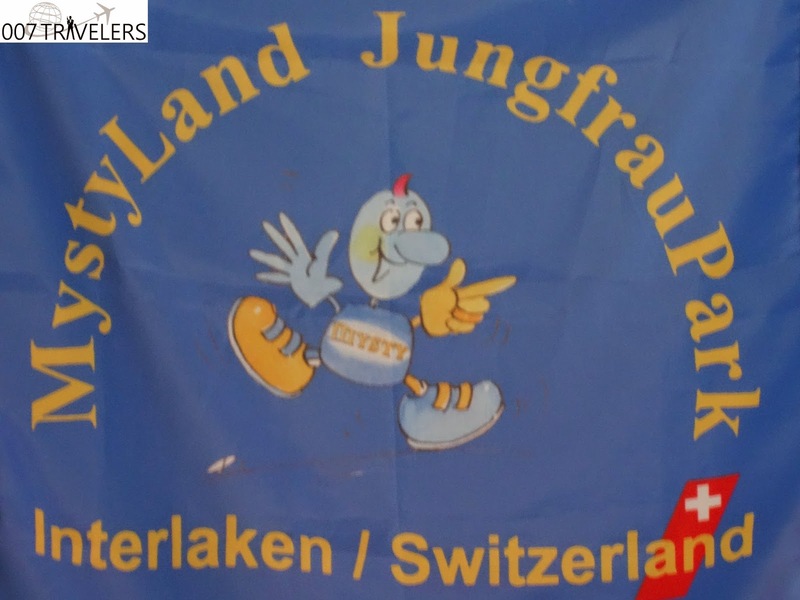 When train was at Interlaken Ost, we took a taxi and went to an amusement park called The MystyLand JungfrauPark. 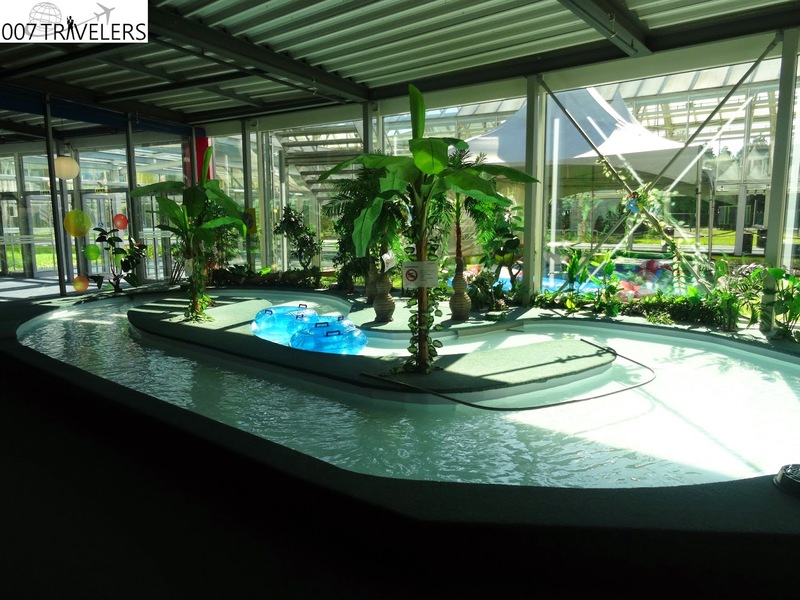 The MystyLand is a huge Indoor & Outdoor Children Paradise especially for children from 2 to 10 years. 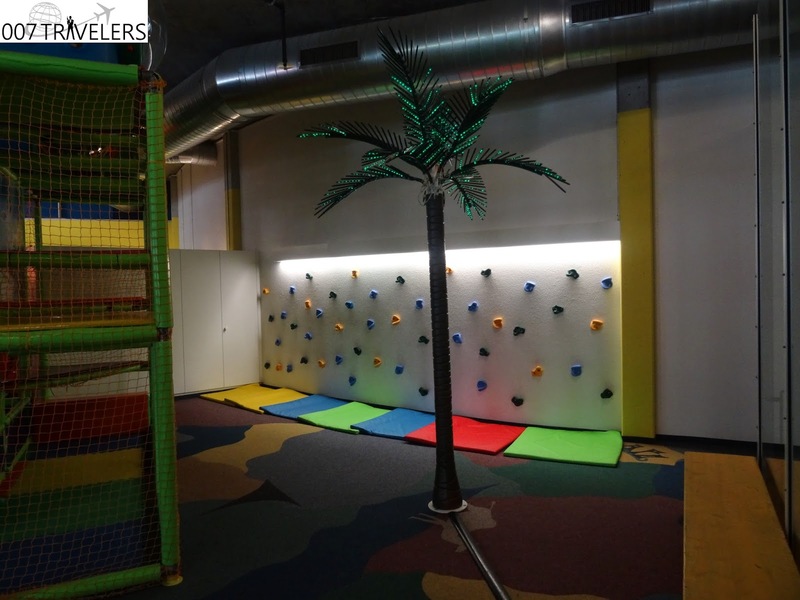 Children can play in a child friendly area. For the accompanying adults there is a restaurant in the middle of the playground and also a terrace. 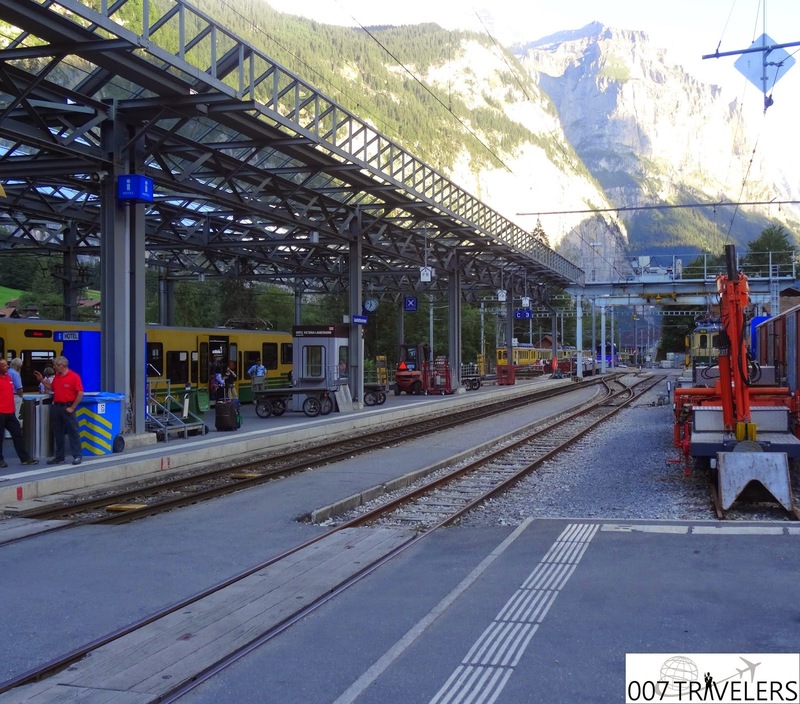 After spending a couple of hours there we took a train back to Lauterbrunnen and filmed its railway station where Irma Bunt and Grunther (Yuri Borienko) meet James Bond who is disguised as Sir Hilary Bray. 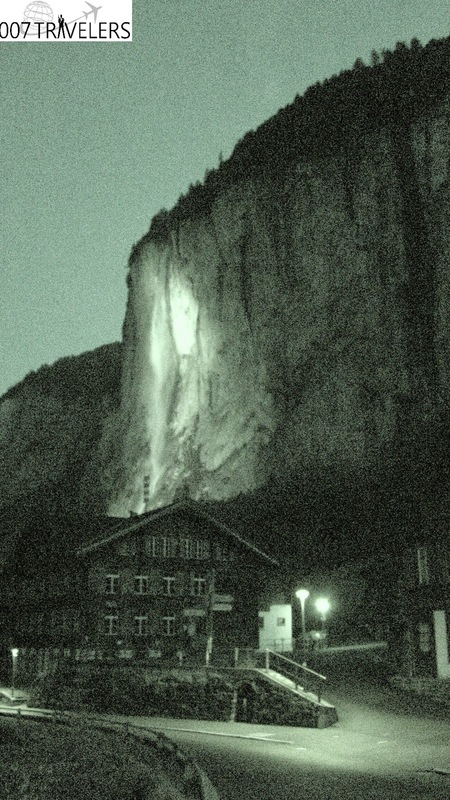 Lauterbrunnen railway station in "OHMSS"
Bond's ally Campbell (Bernard Horsfall) follows the meeting behind his newspaper. 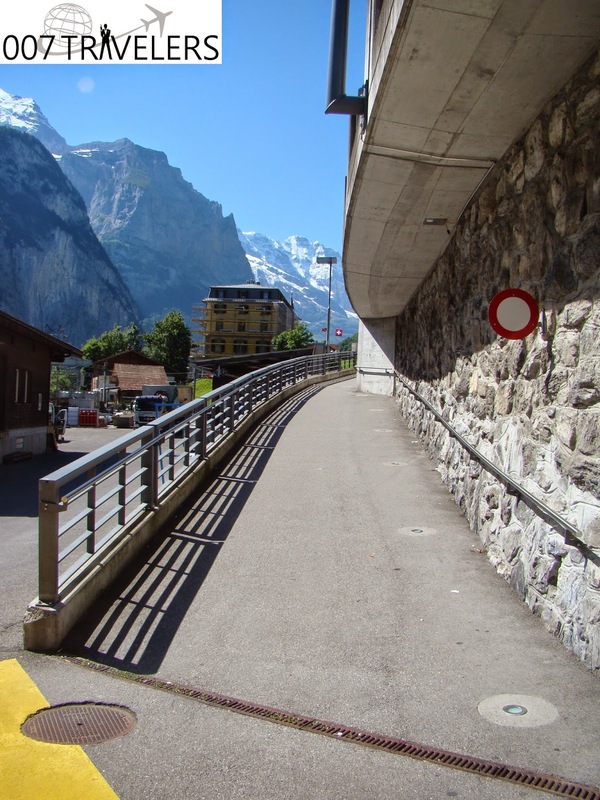 This ramp is only a few steps away from Lauterbrunnen railway station and it can be seen also in the movie. Nowadays the ramp is too narrow for the cars. 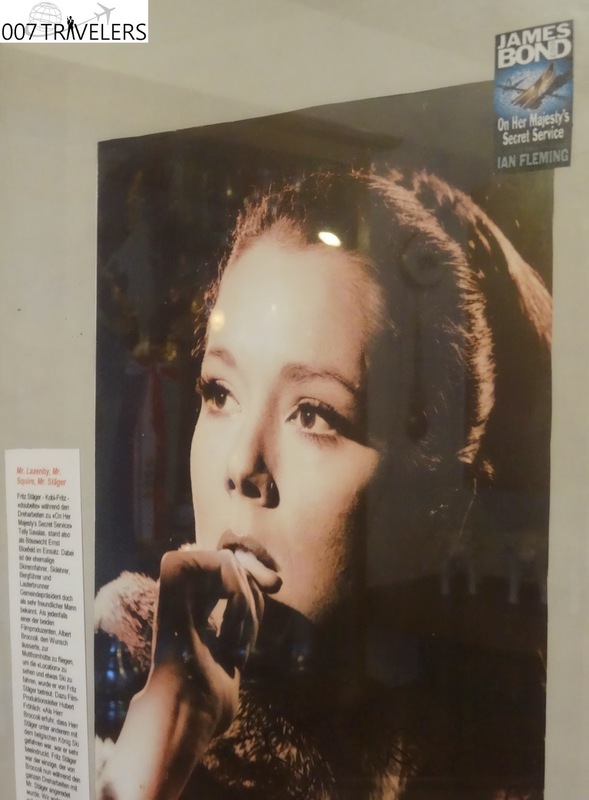 Then we walked back to the Hotel Jungfrau, and we had a lovely dinner at the hotel's restaurant, where George Lazenby's and Diana Rigg's pictures are on the wall. 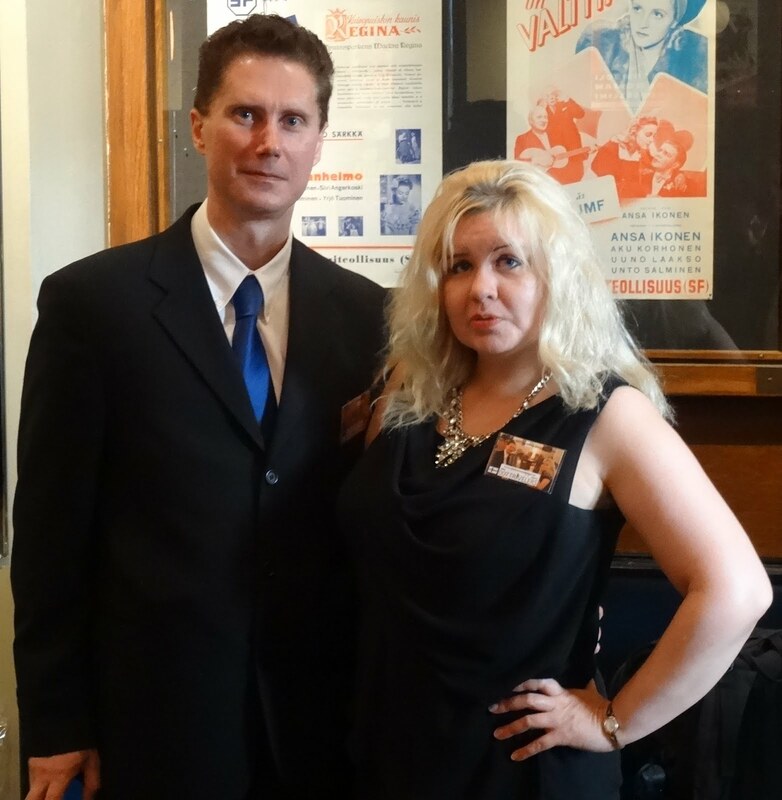 We met also Mrs. Zwahlen one more time. 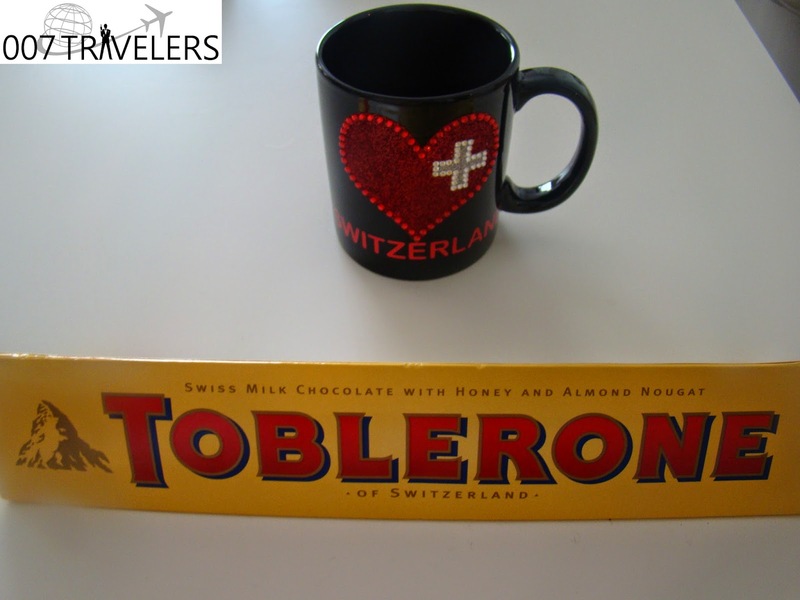 She gave us some nice souvenirs, a Switzerland coffee cup and Toblerone chocolate. Toblerone was created by Theodor Tobler (1876–1941) in Bern, Switzerland in 1908. Theodor Tobler, with his cousin Emil Baumann, developed a unique milk chocolate including nougat, almonds and honey with a distinctive triangular shape. The image of a bear is hidden in the Matterhorn high mountain, symbolizing the town of the chocolate's origin. The product's name is a portmanteau combining Tobler's name with the Italian word torrone (a type of nougat). Bern is known for its bears. 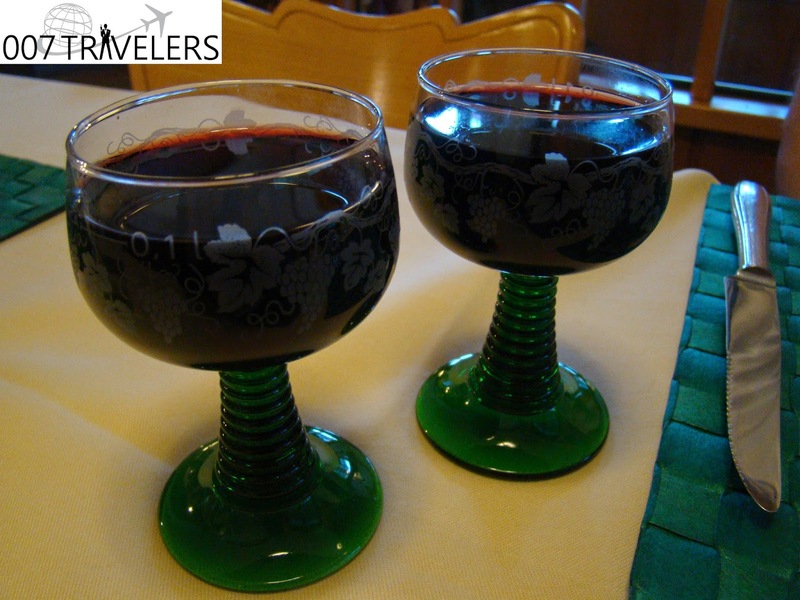 The story tells that Bern has got its name, because bear was the first animal that was hunted there. 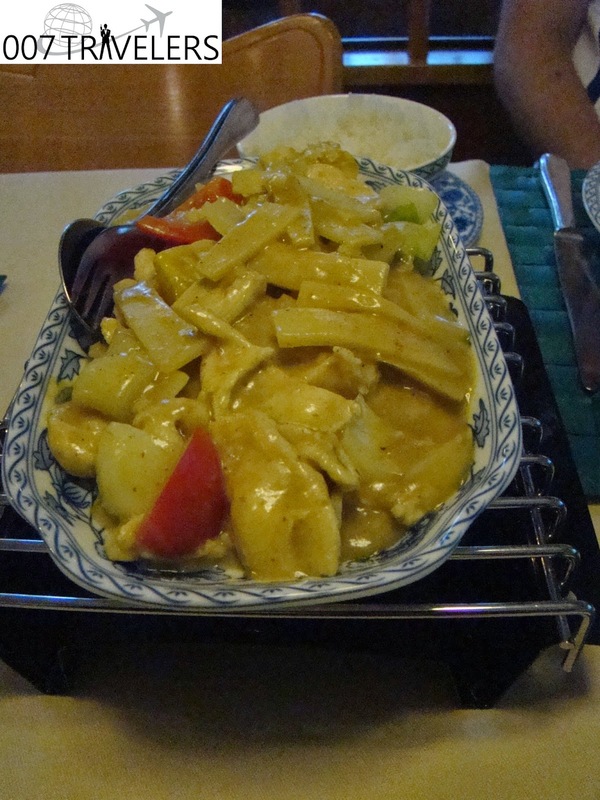 At that time, nearly a thousand years ago, the region was still covered by forest. 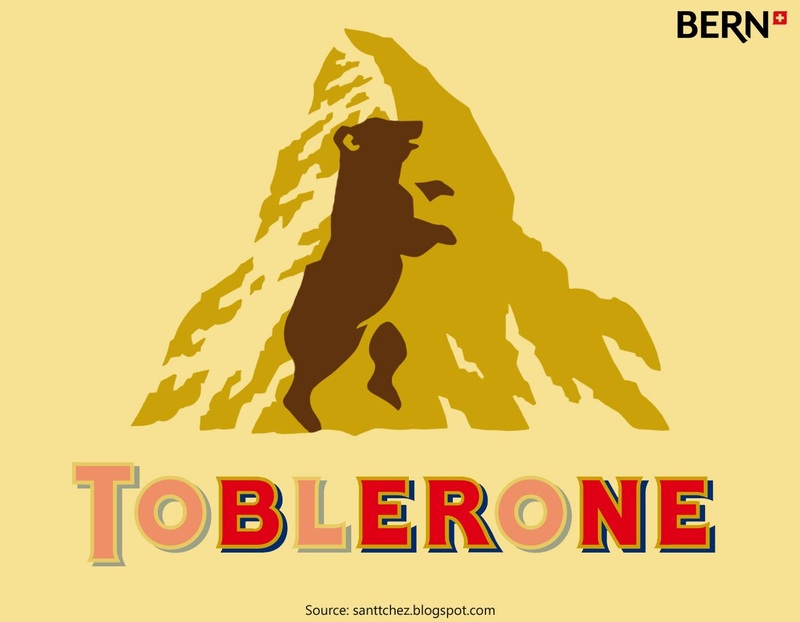 The name also contains the name of the place where it is produced: TOBLERONE (Bern or Berne). And the logo contains a bear, the emblem of the city. 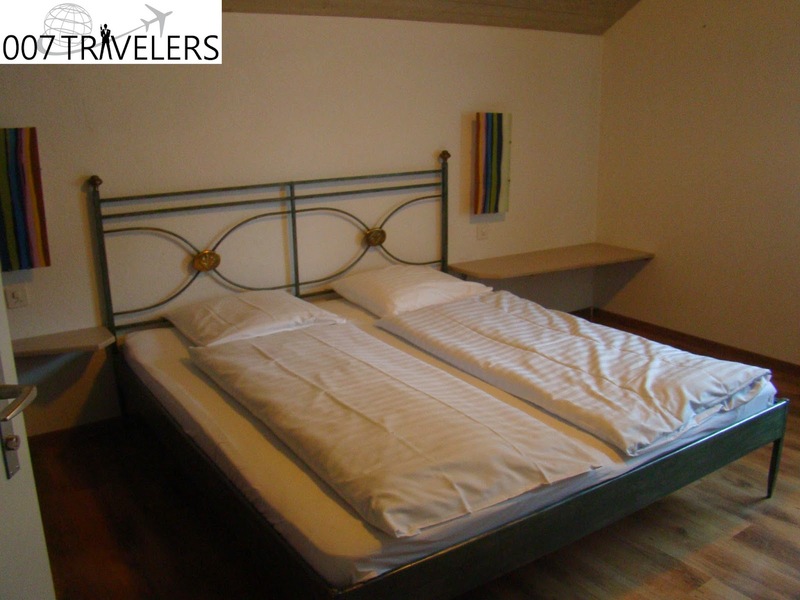 Then it was time to go to sleep and be ready in the morning to wake up early in order to reach Interlaken again in time, because we had a car reservation made. Our plan was to reach as far as Verzasca Dam, to see where Bond made his famous bungee jump in "GoldenEye" (1995). Such a shame the phone booth is gone. I sent an angry postcard to the mayor of Lauterbrunnen and asked to get a new booth since so many people comes to see it. Nothing's been done, maybe the postcard never reached him. 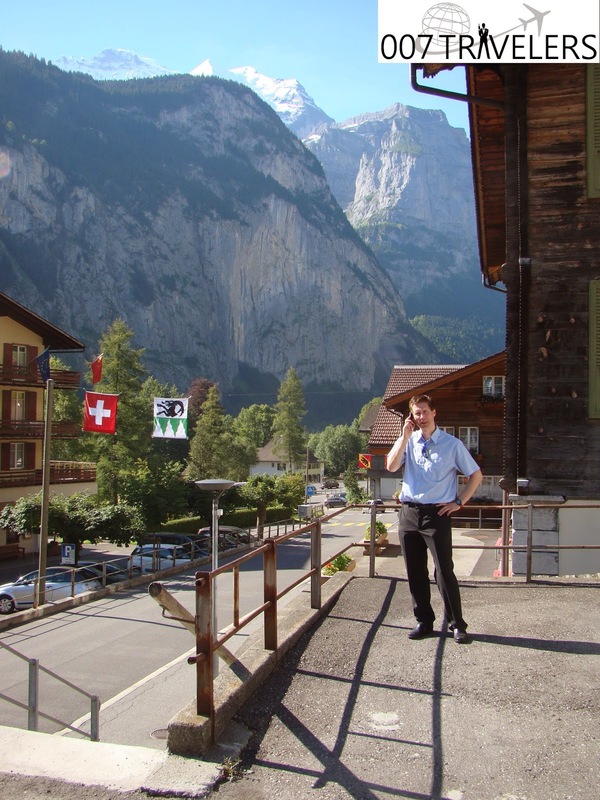 I addressed it simply The Mayor, Lauterbrunnen, Switzerland..